Sony has probably meant to launch the SmartBand 2 with more fanfare but instead the device got leaked by the SmartBand 2 app for the Android platform. Apparently, Sony SmartBand 2 SWR12 with heart-rate sensor is set to be announced formally in a day or two. The SmartBand 2 companion app also teases an image of the SWR12 SmartBand 2 with the heart-rate sensor on the inner side. As per the details, the heart rate sensor measure the pulse at an even rate through the day. Optimized mostly for the Xperia family of smartphones, the Sony SmartBand 2 SWR12 should be compatible with other devices but its functionality may not be optimal with them. The companion app enables Lifelogging which includes keeping a tracking of your location, daily activities, pulse rates and heart rate variability (HRV), and even sleep. 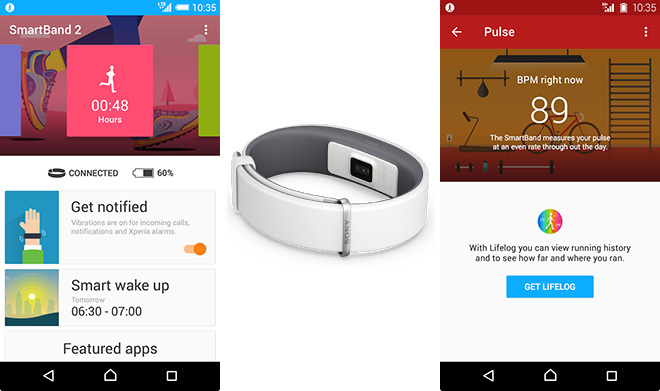 The SmartBand 2 app is already available on Google Play Store for Android 4.4 and above phones.